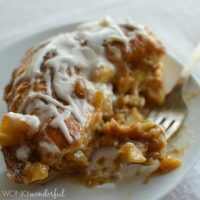 Let me start by saying, this Apple Fritter Breakfast Casserole Recipe is out of this world amazing! I can’t take all of the credit. 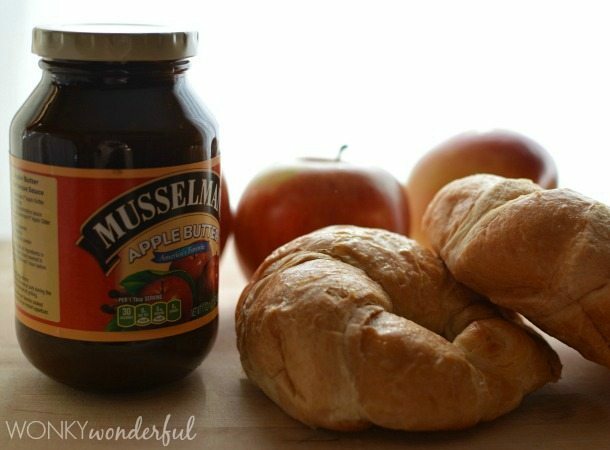 With layers of flaky croissants, caramelized apples and cream flavored with Musselman’s Apple Butter all baked to perfection. Top that with sweet glaze . 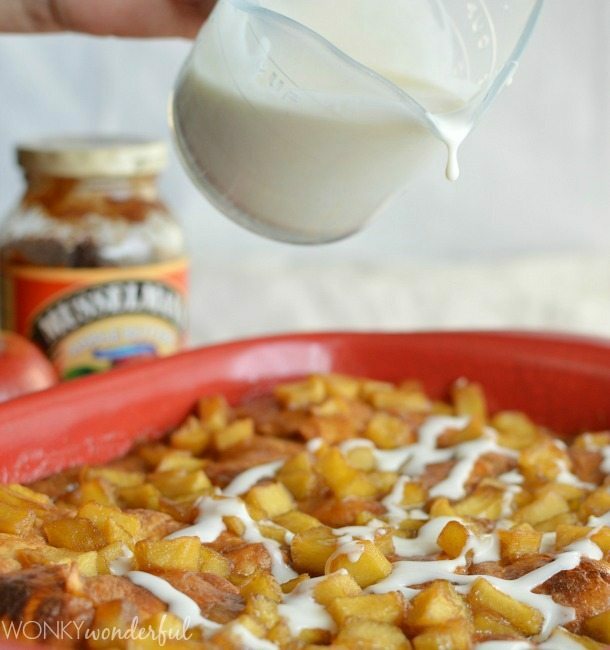 . . there is no way that this Apple Fritter Breakfast Casserole could be anything but delicious! This tasty recipe is sponsored by Musselman’s. 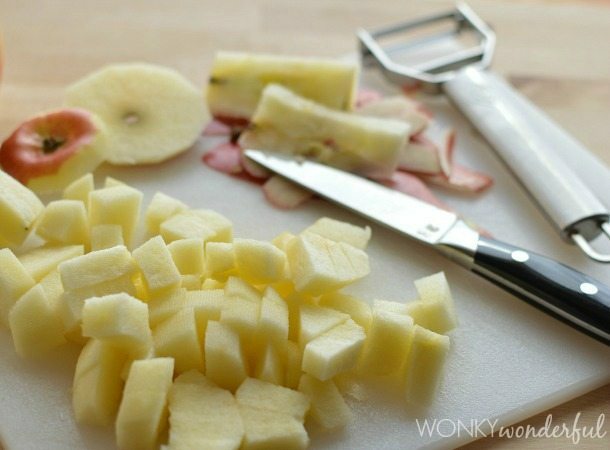 The chunks of fresh apple add texture. 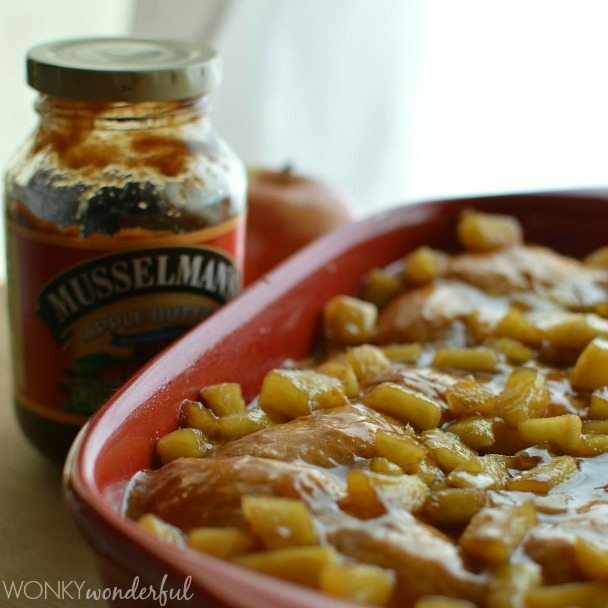 While the Musselman’s Apple Butter provides the concentrated apple flavor. 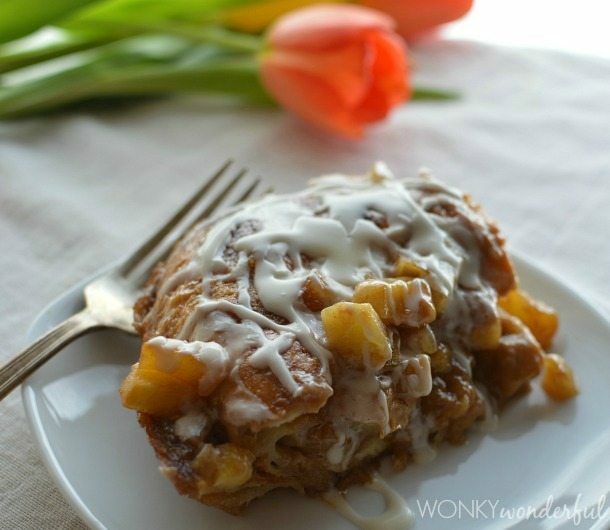 Enjoy the Apple Fritter experience without making a trip to the donut shop! This recipe is perfect for a weekend breakfast or brunch. 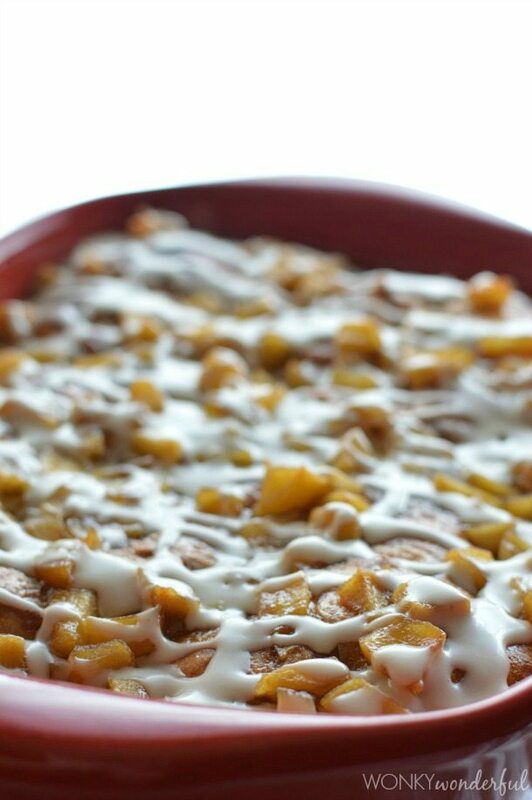 With minimal effort, you can serve up this Apple Fritter Breakfast Casserole to your hungry family and friends. And don’t forget that Mother’s Day is right around the corner. Show your Mom that you appreciate her with a surprise brunch. Apple Fritters are my all time favorite donuts. I either get a fritter or a glazed old fashioned. The glazed old fashioned is the donut I choose when I’m watching my weight. What? No donuts on your diet plan!?! Goodness Gracious! 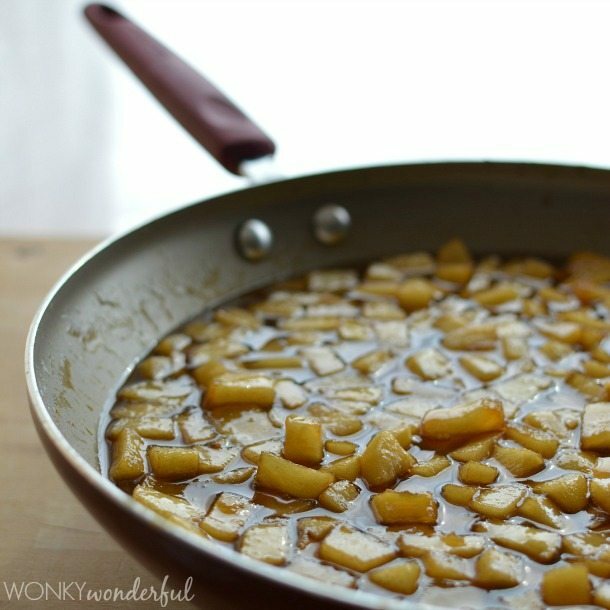 Is there anything more beautiful than apple chunks swimming in sugar and butter? Answer: No. Easy Peasy! Prep . . . Bake . . . Glaze . . . Eat. Gratuitous Glaze GIF … You’re Welcome! A little slice of heaven on a plate along with a colorful Spring tulip arrangement. Brunch never looked so good! Melt butter in a large sauté pan, over medium heat. Add brown sugar and stir until completely incorporated. Transfer chopped apples to pan and stir until coated with sugar mixture. Cook for 5 minutes while stirring frequently. In a small bowl, stir together the corn starch and warm water. Add the corn starch mixture to apples and continue to cook/stir for 5 more minutes. Remove from heat and set aside while prepping the other ingredients. The apples should be soft and the liquid will be a syrup consistency. Whisk together the heavy cream, Musselman's Apple Butter, eggs and cinnamon. Spray 9x11 casserole dish with non-stick. Place the bottom halves of the croissants in an even layer. Pour half of the apple butter/cream mixture over the croissants. Top with half of the caramelized apple mixture. Arrange the croissant tops in an even layer. Top with the remaining cream mixture and apples. Pour all of the syrupy apple mixture over the casserole. Gently press down on the top with a wooden spoon or spatula. Bake at 375° for 25 minutes. Once lightly browned on top; remove from oven, glaze and serve. 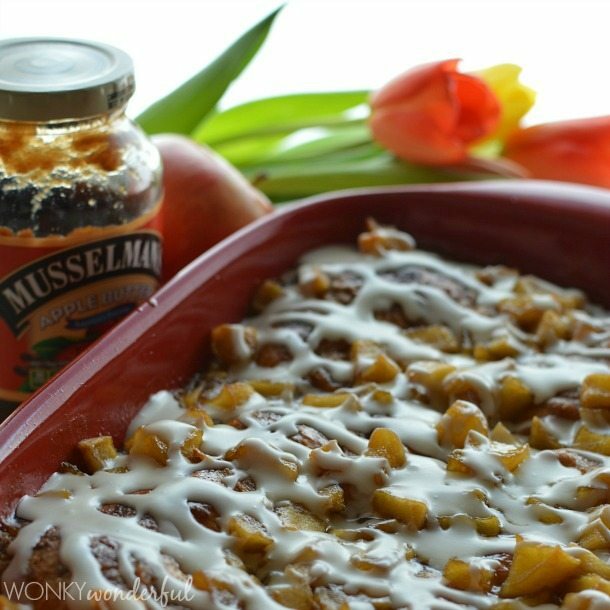 Don’t forget to download your Free Musselman’s e-Recipe Book! This sponsored content brought to you by FTD and Musselman’s Apple Butter. I tried this for Christmas brunch. I added 1/2 teaspoon apple pie spice to the apples and casserole and used the apples I had around. I wish I would have added much more cornstarch to the apple mix, The finished product smelled and tasted heavenly, but was soggy, more like a wet bread pudding. Oh no. I;m sorry to hear that. If you make it again more cornstarch or cooking a bit longer will thicken it up for you. Do you think it would work to make the apple filling in advance and refrigerate a day or two before assembling the dish? I would think that would work fine. I haven’t tried it though. Well that is strange. 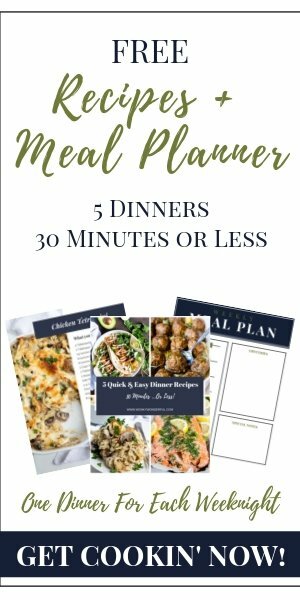 I’m not sure how cornstarch and eggs could bake for 45 minutes and still be thin. Perhaps your apples released more juice.